Muscovite sound artist slash mad scientist vtol (aka Dmitry Morozov) has been at it yet again. This time, inspiration struck when his iPod earbuds tangled. (Good thing he hadn’t upgraded to wireless!) And the result was a new visual interface for music, embodied as kinetic sculpture. Volnovod, sounding for all the world like a long lost Soviet lunar probe (or, um, sounding like “waveguide” if you happen to speak Russian), is an installation / controller / instrument built on the idea. And it comes from the artist just as he’s fresh off a rich Berlin exhibition full of ingenious inventions. The basic idea is deceptively simple: two motors twist a bit of wire, and a camera uses the image of that white edge against a black background to determine a control. That could feed, in fact, anything – fundamentally this is just a controller – but molding wave shapes is an obvious and elegant first step. This iteration works with Pure Data and Max/MSP, and can send control signal via OSC or MIDI. I’ve came up with the idea of this device during a long flight, when my iPod earbuds (the standard white ones) got caught up yet again. The wires of this manufacturer are covered with special rubber that grants the earbuds a unique feature: they do not fracture or bend; they just intertwine endlessly, which prolongs their lifespan and prevents contact damage. Therefore, in a typical coincidence, my wire intertwined many times and I noticed that it resembled a complex multidimensional wave. The concept of the machine came across my mind at once: a machine that would deliberately intertwine this kind of wire in different ways, then a camera would digitize it and a special algorithm would transform the result in a parametric graph controlling different parameters of sound synthesis. The device ‘Volnovod’ is a result. 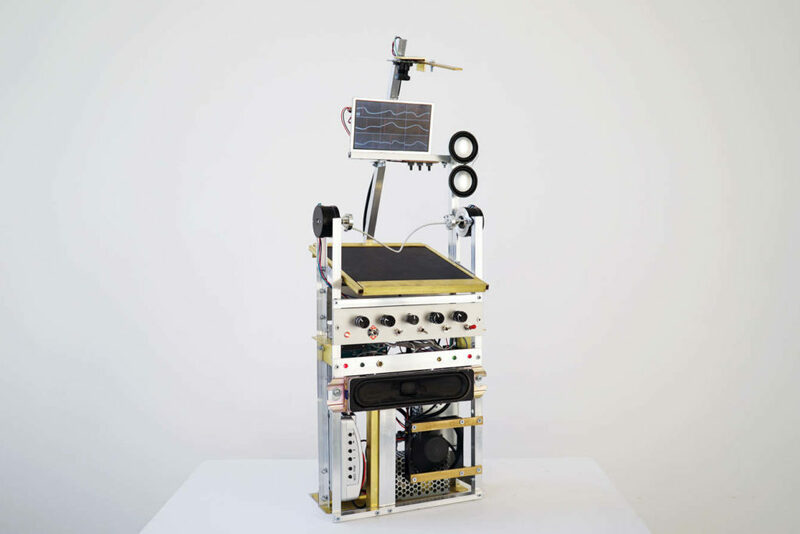 I think of this device as a hybrid machine, which combines a kinetic sound sculpture and a unique controller/tool. It bases on the concept of some small phenomenon being adapted, raised and automatized. Thus, a very peculiar for me combination of a tangible wave and depending on it soundwaves worked out. The device operates in automatic mode, semi-automatic mode or manual mode. Two stepper motors constantly turn and intertwine the wire, moulding different types of waves. Motors operate in accordance with the random numbers-based program and randomly change the direction. Still they rotate within the preset number of steps range to prevent the wire from over-intertwining. The camera shoots a wire in front of a black background, which makes possible to achieve the highest picture contrast. Nine wave pictures are saved. Later they can be updated in automatic mode or refiled manually in semi-automatic mode or manual mode. These nine shots then morph into graphic tables with resolution of 270 x 240 points. 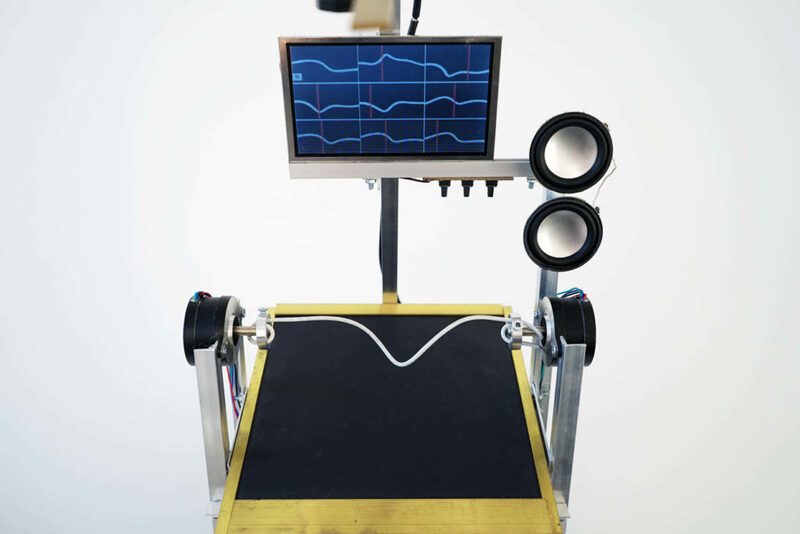 The tables are the base to control sound synthesis options. The program can generate parameters in any suitable format: MIDI, OSC, CV. It allows to use it freely as within the system as with external devices. Graphs reading can be written down automatically or manually, with different velocity in many directions. The wave form can also put to use as a harmonic oscillator wave (akin to wavetable synthesis). While the basic mechanism is simple, this is also a beautiful reflection of a long tradition in visual music – one that centers in particular around Russia. I’ve been fortunate to get to discover some of that history, partly thanks to vtol – and now, with Moscow’s Sila Sveta and ZKM in Karlsruhe, in fact, we’re continuing our look at history as part of the finissage of a show on European art, 1945-1968. You can also look to the tradition of devices like Xenakis’ deeply influential UPIC system, which made similar connections between visual annotation and sound. But what’s exciting about thinking in this way is, once you begin connecting visual to sound, any visual form can be a generative compositional structure for music – and visa versa. It’s genuinely limitless.